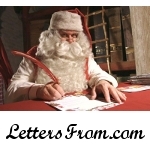 Letters from Santa, Rudolph, Frosty and other members of the Council of Legendary Figures. Our letter from Rudolph offers a fun holiday memory. Completely customized using information that you provide, this letter provides a fantastic holiday memory for the special kids in your life. This letter is also postmarked from the North Pole, as long as the order is placed by December 1. This letter offers the opportunity to reinforce a special chore that the child is supposed to do. It also covers that special thing on their wish list, their friend’s name and the few other specially customized details. Printed on fun holiday stationery, this is certain to be a wonderful Christmas memory for any child. Letters from Santa Claus and other members of the Council of Legendary Figures.